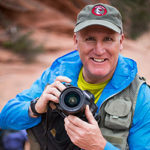 Michael is an award-winning outdoor photographer, weather guru, workshop leader, dog lover and dark chocolate addict. The Taos, New Mexico-based veteran shooter lives and breathes adventure, lifestyle and landscape photography. He transformed his Air Force meteorological and weather forecasting training into mastery of outdoor lighting, with the presence of weather elements being a nearly constant thread throughout his wide-ranging library of work. Clients describe his imagery as adventurous, tranquil and confident all at the same time. Clients also had this to say: “I can easily say Michael is in an elite category of photographers who provide only the best quality work. His photography displays the highest level of technical ability and patience—capturing the perfect lighting and color that many photographers simply don't seem capable of.” “I was immediately drawn to the high energy, bright and personable nature of Michael's work.” The prolific shooter, along with his wife and business partner, Lauri, lived and worked in Alaska for many years where Michael still continues to shoot regularly. His lifestyle, adventure and landscape images have appeared in hundreds of national and international magazines, books, calendars, catalogs, brochures, websites and many other commercial products. The DeYoungs have done extensive assignment work in Alaska and beyond for the tourism industry. On his own and for several notable institutions, Michael teaches and leads landscape, adventure and business related workshops, focusing on creativity, vision and mastery of light. He has been a featured breakout speaker at North American Nature Photography Summits and for several camera clubs, ranging from Florida to Alaska. Notable awards: first place winner, Photo District News Great Outdoors Photo Contest; Highly Honored recipient, Nature’s Best Windland Smith Rice International Photography Award, Smithsonian Institute; and Best of 2012 series winner, American Society of Media Photographers (ASMP). In his own words: &quot;Being an Eagle Scout forged a lifelong love of wild places, wilderness exploration and muscle powered adventure sports. I have always been drawn to mountains and the mountain lifestyle. I like bold colors and simple graphic design. I can’t say I’m completely self-taught as I’ve attended countless workshops and seminars in addition to reading many photographic technique and business related books.&quot; The DeYoungs spend much of their time on outdoor adventures, including long-distance backpacking trips and whitewater river journeys. Dedicated to sustainable living, they reside in a passive solar designed home and office run 100% by photovoltaic power in the upper Rio Grande Valley.